LOS ALTOS, CA--(Marketwire - May 19, 2008) - NearbyNow, the online service that allows US-based consumers to search inventory at stores in their local shopping mall and reserve items to pick up, today announced a new investment of $11.75 million led by Norwest Venture Partners (NVP) to expand the company's Internet and mobile local shopping services. Also announced today -- NearbyNow has partnered with TheFind, Inc., a leading shopping search engine for discovering lifestyle goods, to offer online shoppers using TheFind.com the ability to reserve products at select local retailers. Additionally, NearbyNow has revealed a sneak preview of a new mobile service for the Apple iPhone™ that allows shoppers to graphically navigate a shopping center, search local inventory, and reserve items for pick up. "We are very pleased to have Norwest Venture Partners, one of the world's leading technology investors, on the NearbyNow team," said Scott Dunlap, CEO and President of NearbyNow, Inc., "NVP has a deep knowledge of Internet and mobile technologies, and a successful track record of spotting new consumer trends. We look forward to their experience and insightful direction as we move forward." The $11.75 million Series C investment will be led by Norwest Venture Partners, with existing investor Draper, Fisher, Jurvetson also participating. Joshua Goldman, a Venture Partner at NVP, will join the NearbyNow Board of Directors. Mr. Goldman has over 20 years of operating experience in the search and shopping industries, including his former role as the CEO of MySimon, Inc. and as a member of the Board of Directors at Ask Jeeves (now Ask.com). "NearbyNow offers an innovative and unique approach to shopping that succeeds for consumers and retailers alike," said Mr. Goldman. "Rather than viewing online and offline shopping as completely separate experiences, NearbyNow integrates online product selection, local purchasing, and mobile messaging into a very unique and powerful service. A consumer service with such powerful search features combined with a proven lead generation and marketing vehicle for innovative retailers has all the makings of an extraordinary business opportunity. We're excited to help take the company to the next level." NearbyNow Extends Services with Partnership with TheFind, Inc.
NearbyNow and TheFind, Inc. have agreed to join together to enhance the shopping experience for millions of Internet users by integrating online shopping search with local store inventories. Shoppers using TheFind.com will soon be able to simply click a button to search local store inventories for the products they like and reserve the items for pickup at over 30,000 participating store locations of over 200 leading national retailers. This capability will greatly simplify local shopping by letting consumers, for the first time, search and find the desired product online and then have it put on hold for purchase at a local store location. "Contrary to early predictions, people are coming to recognize that e-commerce isn't where the Internet is having its greatest impact," said Michael Boland, senior analyst at The Kelsey Group. "Instead, the Internet is gaining increasing influence over offline local purchase behavior, which is a much larger category. We're looking at local search more in terms of leading and tracking that behavior, from online research to offline conversion." "Local search is one of the fastest growing trends on the Internet today. It is an area in which we are continually focused on expanding," said Siva Kumar, CEO of TheFind, Inc. "Consumers want to combine the ease of online search with the cost savings, timeliness and hands-on product interaction that can be found by shopping locally. The integration of our two core services -- our comprehensive and powerful product search capabilities and NearbyNow's incredible local inventory access -- will provide the most efficient and easy shopping experience for consumers. TheFind.com shoppers will be able to find more products than ever, locate their items nearby and pick them up all in the same day, saving time and money. By successfully converting online researchers into local shoppers, we can dramatically expand the multi-billion dollar online shopping industry to include the offline world." 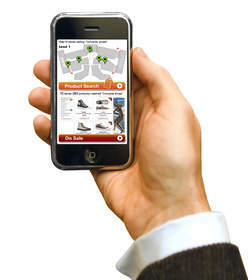 Shoppers on TheFind.com will experience the integrated technology via a "Check Local Inventory" button that that appears in the mouse-over information next to all the products from the over 200 national retailers supported by NearbyNow. A consumer clicking on that button will then be prompted to choose a local store location so that NearbyNow can check inventory of that product at that store and then reserve the item for a scheduled pickup time. NearbyNow today provided a sneak preview of a new Web Application optimized for the Apple iPhone,™ allowing shoppers to graphically navigate a shopping center, search the product inventory of stores, list available sales, and even find the closest bathroom. This application will be the first mobile navigation solution ever created for navigating inside shopping malls, and creates a unique venue for retailers to contextually advertise to in-mall shoppers. The new iPhone Web Application will be generally available in July 2008. NearbyNow, Inc. provides a unique online service that allows consumers to find products, brands, and sales near them at any time using the Internet or mobile phones. NearbyNow powers hundreds of shopping centers across the U.S., allowing shoppers to search store inventory and put items on hold without placing a phone call. The company also creates an efficient marketing tool for retailers to target nearby consumers, helping to drive sales by turning online shoppers into in-store buyers. Find it locally, put it on hold, and pick it up within minutes. NearbyNow is headquartered in Los Altos, CA. Additional information can be obtained by phone at (650) 947-1300 or via the Web at www.nearbynow.com. TheFind.com offers the leading shopping search engine that delivers comprehensive, authentic and visually compelling results for products, specializing in the lifestyle goods category. From the most popular e-commerce sites to the most unique, hard-to-find brands, TheFind.com uniquely crawls the entire Web to find more than 200 million products from over 500,000 stores. By using its patent-pending "product ranking" technology, TheFind.com displays the best-selling products, styles, brands and stores for any shopping search right on the first page of results -- saving consumers time and money. TheFind, Inc. family includes leading fashion shopping website Glimpse, which specifically caters to fashion-savvy shoppers searching for the latest trends and hottest apparel products, and TheFindGreen which finds organic brands, green stores and environmentally-friendly products all in one place. TheFind, Inc. promotes shopping that gives back to the community through its Color For A Cause campaigns, which have included charitable beneficiaries such as The Susan G. Komen Foundation, Doctors Without Borders and Global Green USA. TheFind, Inc., headquartered in Mountain View, Calif., is backed by leading investors Bain Capital Ventures, Redpoint Ventures and Lightspeed Venture Partners. Norwest Venture Partners (NVP) is a global venture capital firm that has actively partnered with entrepreneurs to build great businesses for more than 45 years. NVP focuses on investments in information technology including: software, services, enterprise and communications systems, semiconductor/components and Internet, media and consumer. The firm currently manages more than $2.5 billion in venture capital out of its office in Palo Alto, California. Managing Partner Promod Haque has been ranked as a top dealmaker on the annual Forbes Midas List for the past three years. In 2004, Forbes named him as the #1 venture capitalist worldwide based on performance over the last decade. NVP has funded over 400 companies in the U.S. since inception. Some of the firm's recent investments and transactions include Adventity, Airespace (acquired by Cisco Systems), deCarta, DoubleFusion, Jigsaw, KACE, mBlox, Omneon, Open-Silicon (acquired by Unicorn Investment Bank), Persistent Systems, Rackspace, SideStep (acquired by Kayak), Spinnaker Networks (acquired by Network Appliance), Veraz Networks, Winphoria Networks (acquired by Motorola) Yatra, and Yipes (acquired by Reliance/Flag Telecom). NVP has also funded such market leaders as Actel Corporation, Cerent (acquired by Cisco Systems), Documentum, Extreme Networks, Forte Software (acquired by Sun Microsystems), PeopleSoft and Tivoli Systems (acquired by IBM). For more information, please visit www.nvp.com. The iPhone™ is a trademark of Apple, Inc.
Arora PR for TheFind, Inc.